There’s a reason we’re the most popular zip line in the Okanagan – You only have one chance to have a bucket list experience, and we deliver in spades. Each of our lines is designed to give you a different thrill, whether it’s soaring gracefully across the canyon, free-styling or “Doing the Dangle” , every line is unique. We have tours to suit your time and budget. From a quick 2-line tour, to the full 6-line tour and Leap of Faith challenge. Your choice, your way. The longer the lines, the longer the ride. It’s that simple! The total length of our zip lines is 2.1 kilometers! That’s a lot of zip lining fun! The higher the lines the more exhilarating the ride! Being high in the air is an adrenaline rush you won’t get very many other places unless you’re a BASE jumper or Skydiver! We have some of the highest lines in Canada – a staggering 381′ high! In fact, they are so high we had to have special permission from the Transport Canada to install them! At ZipZone each line has a different speed. Some of our lines are designed to give you maximum air time over the canyon; we want you to relish flying 381ft in the air, upside down, hanging by a tether, and some are designed for high speed; for the exhilarating rush of plunging through the air, with the canyon walls rushing by! Like everything in life, there are good options and cheap options, but a bucketlist experience isn’t something you want to skimp on. For only a few dollars more than a budget zipline, you can enjoy the #1 experience in the Okanagan, with top of the line safety equipment and the highest ziplines in Canada. Peachland is only 20-30 minutes drive from Kelowna and Penticton, and highway all the way. Once you’re there, turn off Hwy 97 and drive 8km to our site. That’s it! Zip through the most beautiful scenery BC has to offer – Deep Creek Gorge is a geological wonder! All guide staff go through an intensive five day, site specific training program. It is built around U.S. ACCT standards. After that is a 2-3 week mentored integration period, followed by ongoing refresher training throughout the year. Only the best are selected to work for us. ZipZone is recognized as the safety leader in BC. Co-owner Josh Sears volunteers on a technical advisory committee, tasked with harmonizing and improving zipline standards throughout BC. Our Little Zippers program is setting the standard for kid safety. Kids under 70lbs should not zip solo and they definitely should not zip in tandem with an untrained companion (even if it’s Mom or Dad), and that’s why we developed the Little Zipper program. Little Zippers ride in tandem with one of our professionally trained guides, who give your kids extra care and extra fun. At ZipZone we use Petzl ™ Navaho Bod harnesses. They are very expensive, but they are the same lifesaving harnesses relied on by professionals working on skyscrapers and bridges, day in, day out. Our harnesses aren’t cheap universal, one-size-fits-all, which is what discount operators use. Ours are properly fitted for each guest. We won’t compromise your safety. 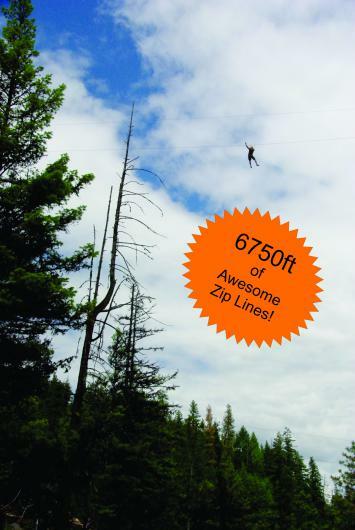 At ZipZone you get to experience our unique, Do the Dangle® ride, where you fly upside down 250’ in the air! Zipping upside down requires additional safety precautions and specialized equipment, and we’re proud of our trademarked safety systems that let you enjoy the exhilaration and freedom of “Doing the Dangle”, knowing you’re always protected. All the equipment you need to zip safely is included in your tour price; that’s your Petzl™ harness and helmet, your primary and backup tether systems and your Do The Dangle® tether system which keeps you safe when you’re upside down. Ziplining is great fun, and the main attraction, but when you’re at our park you also get treated to some amazing surprises (we’re not telling you what they are, but you’ll spend a lot of time laughing!) and can spend as much time as you like in our unique Puzzlearium! These are included in the price of your tour! WHAT DO FACEBOOK USERS SAY? We are the #1 zipline in the Okanagan, and when guests have had a great experience, they post about it on Facebook. Check out our Facebook Page at Facebook.com/ZipZoneBC and read all the great comments we get.